Stars & Stripes Patriotic 4th Of July 10 1/4" Square Paper Plates 50ct. 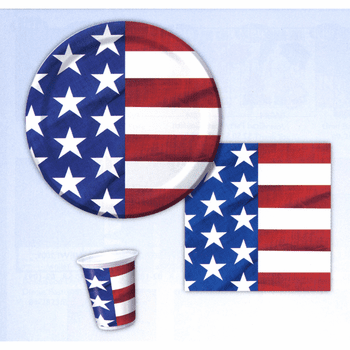 Rustic Flag 7" Patriotic Dessert / Cake Paper Plate 50ct. Rustic Flag Patriotic Lunch Napkins 50ct. Rustic Flag Patriotic Beverage Napkins 50ct.